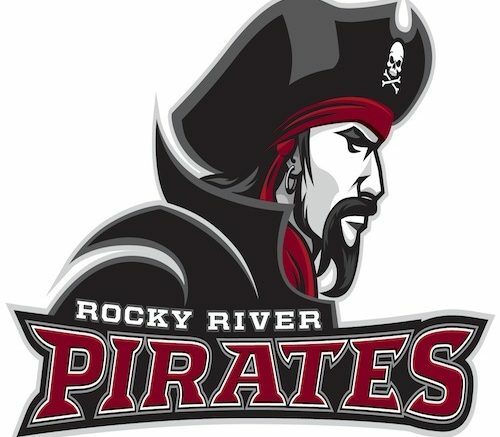 Ross Hartman hit a 2-run homer in the first inning to give Rocky River a lead they would not relinquish, en route to a 4-2 win at Elyria Catholic on Tuesday afternoon in Great Lakes Conference play. It was the Pirates first win vs EC in this conference. Jack White added a two-run double in the third inning to give the visitors a 4-0 lead off of Senior Max Manners(0-1). Hartman(3-0) pitched 4 1/3 innings, giving up one run on two hits and getting out of precarious situations all day. In the first inning, the Panther had runners on f second and third with only one out and cleanup hitter Jack Walsh at-bat. Grant McClure had been hit by a pitch, stole second and advanced to third on a passed ball. Brendan Holley had walked and stolen second. Hartman induced a two-strike flare from Walsh that looked like it would drop for a hit over River second baseman, Tommy Kelly’s head. Instead, Kelly went back on the ball, tripped, somehow caught the fly and from the ground, sent a perfect throw to shortstop Grant Eversman to double up Holley at second, by a hair. In the third inning, EC loaded the bases with no outs by a walk, hit batter and a bloop single. Third baseman Dillon Bandi backhanded a shot down the line by Holley to force the runner at home, then Walsh grounded into a 6-4-3 bang-bang double play to end the inning. Bandi came on to pitch in the final 2 2/3 innings, giving up a run on a wild pitch. Menners pitched the first three innings for the hosts. Walsh came on to pitch four scoreless innings and struck out five visitors. The two teams are scheduled to meet again on Thursday, April 11, at Rocky River, at 4:30 pm.